After a peaceful sleep I wake up at 6AM sharp but my heart is about to explode. I’m experiencing a mint tea hangover and I need to burn off some excess energy. After some recent reflection I’m concerned I might be part shark because if I stop moving I’m afraid I’ll die, this makes sleeping difficult for me. Across the room I can hear my sister rousing. She takes a little extra time to get moving. My sister sleeps like the dead, any time of the day, anywhere. I don’t really rest like normal people. I wake up each morning after a night of oxygen deprivation caused my sleep apnea. The only thing that can get me going is a self induced phycological dose of adrenaline. Basically I demand my body to “GO!” and I wake up like Mia Wallace after Vincent stabs her in Pulp Fiction. Anyway, it’s time to get going and I’m pumped. I’ve been running habitually for about 5 years now. It has become part of a required set of conditions that like a rare planetary alignment causes me to sleep normally. If I skip a day I feel tremendously unfocused and I have an exceedingly hard time going down at night. 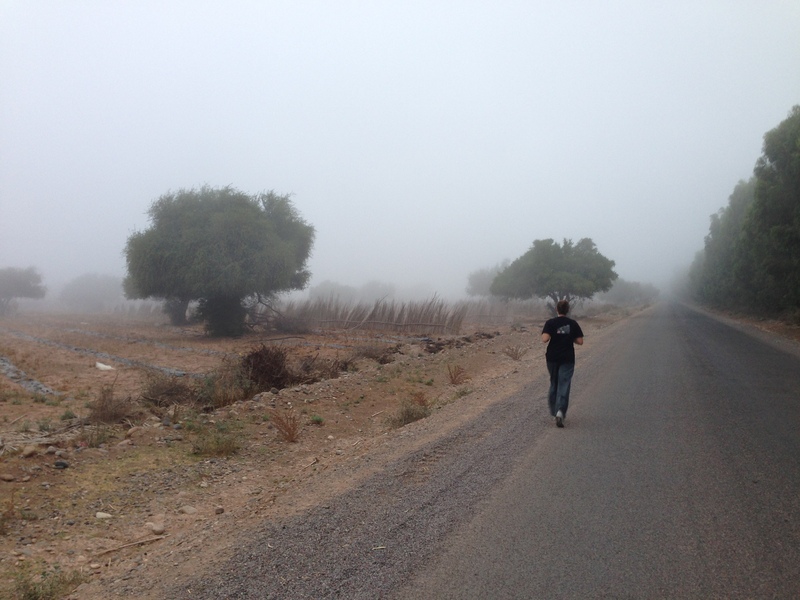 In Morocco it’s extremely important to get your exercise done early before the daily inferno cooks everything in sight. So we don’t waste any time. We step out of my sister’s house onto a dusty street with a few errant plastic bags floating around. Interestingly there’s a thick fog across the town and visibility is fewer than 100 yards. It almost feels coastal and the temperature is just right for a long run today. We jog toward the soccer pitch and head left through the edge of town then down a tarmac covered road. We pass camel corner but the air is too thick to see anything. We veer to the right and small settlements start to reveal themselves as we get close. At first they look ruinous because there’s a building tax in Morocco once you complete construction. That means just about every edifice has rebar sticking out of the top of it so as to avoid paying the fee. Everything in constantly under construction. We head south and run for another few miles passing orchards before turning back around. As we finally return to town the sun has started to burn off the fog. Three camels greet us as we cross the finish line back home. It’s going to be hot soon.